At the Elenbass cherry orchard in the Netherlands, we observed very healthy and productive 5 ha of cherry orchards on dwarf Gisela rootstocks under Voen rain covers. Grower Johann Elenbaas along with Voen representative Ferdinand Sailer (pictured, left) told how growing cherries is impossible in the humid Dutch climate without covers, and the advantages of Voen, including cost, ease of put-up and take-down, and strength in wind. Johann says Colt rootstock (large trees) are “history” in their orchards because the Gisela rootstocks 5, 6, and 3 are twice as productive. Final stop today was a young pear orchard owned by Van Kessel and managed by Jans van Dyk. 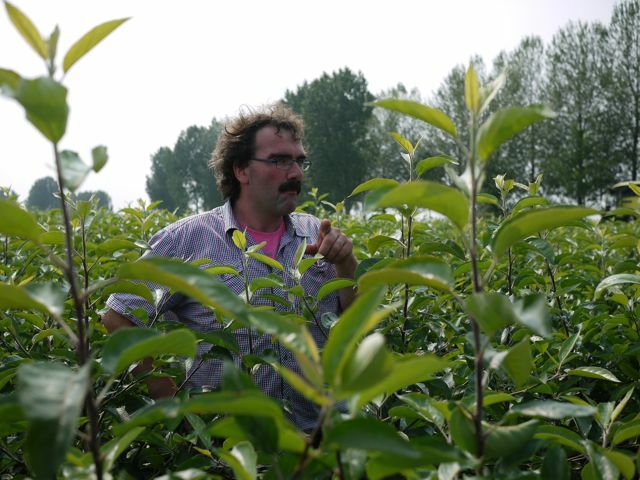 This 2nd-leaf orchard is producing an excellent yield as a result of high quality trees supplied by Verbeek Nursery and pruning skills exhibited by Jans. This pear orchard was touted as a “must see” while we were in the Netherlands, and that was no brag — it was a “Uber pear orchard” as one Tour attendee put it! On the morning of July 25, 2011, 42 IFTA European Summer Tour attendees arrived via bus at East Malling Reasearch (EMR). Any apple grower worth their salt know this is the home of the legendary semi-dwarf and dwarf apple rootstocks such as Malling (M.) 26 and Malling (M.) 9. EMR has more recently successfully transitioned from a mostly (formula) government and industry funded research station to a combination of government and private industry grants and also a Conference Center. 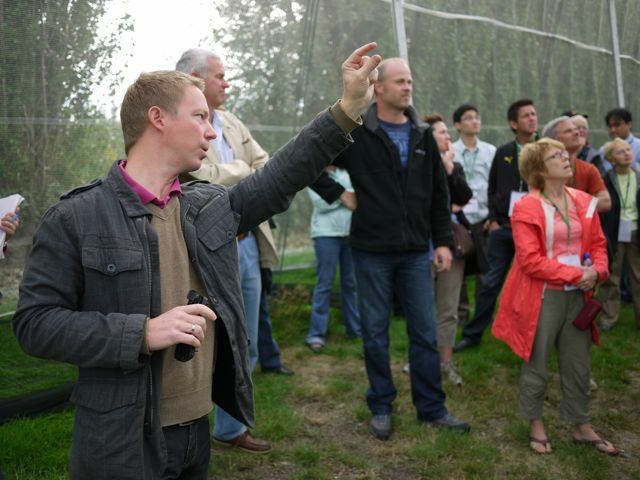 As outlined by Dr. Peter Gregory, recently hired Director of EMR, core research capabilities of the research station include genomics, pest management, post-harvest physiology, and general crop management with "sustainable increased production of horticultural (primarily perennial fruit) crops." Professor Jerry Cross explains the objective or a recently planted and sizeable organic apple orchard on M.9 rootstock at EMR. That is to both provide research opportunity and fruit sales. The latest organic apple crop -- 'Rajka' apples, pictured below -- fetched twice the price of conventional apples on the local UK market. 'Rajka' apples in the young organic apple orchard at EMR. Dr. Jean Fitzgerald answers a question from Daniel Cormier, Quebec, Canada, about her work with biological pest control including predator/pray interactions and favored predator host plant identification. Dr. Marke Else displays some equipment used to monitor water content of soil in the 'Concept Pear Orchard' at EMR. An irrigation experiment he is conducting looks to see when the pear trees actually need water to sustain growth vs. regularly scheduled irrigation intervals that do not account for the actual plant need for water. Irrigation research addresses the objective of EMR to find ways to use resources more efficiently and address changing climate. 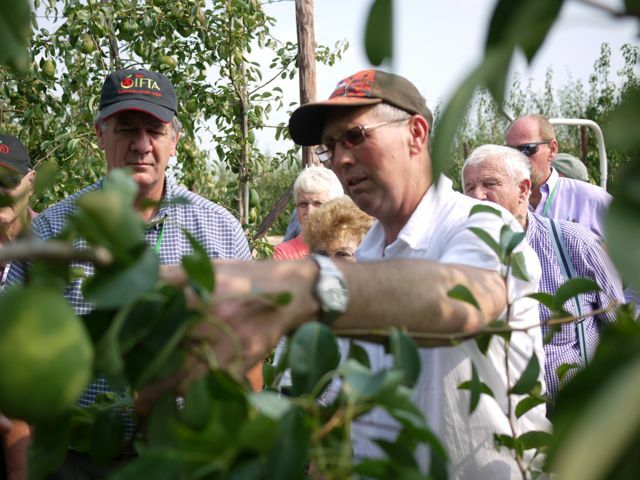 Graham Caspell, Crops Manager for EMR explains details of the 'Concept Pear Orchard,' which is planted on dwarf quince rootstock with four training systems including double- and single-leader, a slender-spindle, and a 4-leader 'V.' Money to plant the orchard was donated by an industry supplier, however, EMR is now responsible for maintenance but can in-turn sell and profit from the harvest of these 'Conference' pears. Dr. Dave Simpson, strawberry breeder at EMR shows off some of their just recently released everbearing strawberry selections: 'Serenity' and 'Buddy' strawberries Strawberry breeding focuses on matters of importance -- disease-resistance, flavor and shelf-life, and a ligher color berry -- to UK growers of strawberry. Strawberry is the largest fruit crop value in the Kingdom, and 85% of production is in tunnels. Advanced strawberry selection from Dr. Dave Simpson's strawberry breeding program at EMR.